Welling were defeated on Tuesday night against a determined St Albans. It was the Wings third midweek defeat of the season and it was an uncharacteristic below par performance. The hosts set the tone for the game in the 3rd minute when Ben Herd cross come shot cannoned off the bar. Welling slowly tried to get into the game as Montel Agyemang shot just over from range. 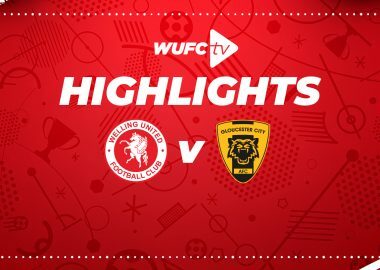 However the home side went ahead in the 9th minute, Solomon Sambou played a defence splitting ball through to Da Costa and with Welling screaming for offside the striker finished emphatically past Wilks. Welling almost made an immediate reply but Bradley Goldberg’s shot lacked power and was easily saved. Jordan Gibbons was showing some good attacking intent and he went on a great run that resulted in him crossing low that keeper Snedker fumbled, as the ball hit the post and out for a corner. The Wings were looking to play patient football in order to try and break down the resolute St Albans defence down, the play resulted in Goldberg seeing his shot deflected wide. Ben Wyatt’s free kick was glanced just wide by the head of Dave Diedhiou. On the stroke of half time Thierry Audel headed wide as Welling went in behind at the break. St Albans came out bright in the 2nd half and it took a superb save from Dan Wilks to deny Clovis Kamdjo from a corner. Kamdjo then missed a glorious opportunity but he fired wide from close range when he looked certain to score. However in the 68th minute the home side did get the 2nd goal. A deep cross from Tom Bender alluded the Wings defence and Moyo had time to control and smash past Wilks. Audel then came agonisingly close from getting The Wings back in the game but his outside of the boot effort went just wide. L’Ghoul was still causing St Albans problems as he twist and spun in the area but he shot straight at the keeper. St Albans were still having plenty of chances to add to their tally as Moyo picked up on some slack play but his effort was deflected wide for a corner.. The Wings almost grabbed a consolation as L’Ghoul cut inside the areabut Snedker made a smart save. 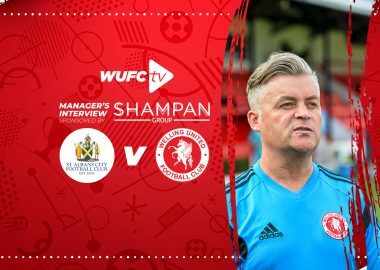 The defeat brings their good run to an end, this was Welling’s first defeat in the league since August and they will look to start a new run when Wealdstone visit Park View Road on Saturday.